Reading and share top 15 famous quotes and sayings about Mythologies by famous authors and people. 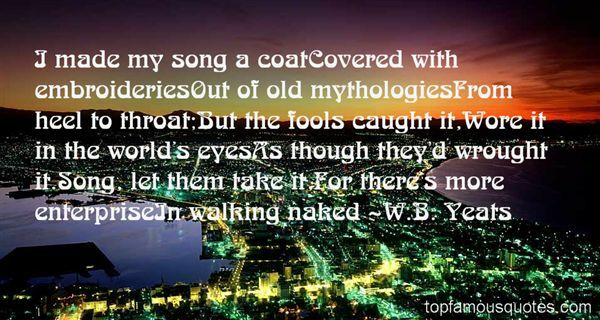 Browse top 15 famous quotes and sayings about Mythologies by most favorite authors. 1. "Artists don't make objects. Artists make mythologies." 2. "We don't worship Satan, we worship ourselves using the metaphorical representation of the qualities of Satan. Satan is the name used by Judeo-Christians for that force of individuality and pride within us. But the force itself has been called by many names.We embrace Christian myths of Satan and Lucifer, along with Satanic renderings in Greek, Roman, Islamic, Sumerian, Syrian, Phrygian, Egyptian, Chinese or Hindu mythologies, to name but a few. We are not limited to one deity, but encompass all the expressions of the accuser or the one who advocates free thought and rational alternatives by whatever name he is called in a particular time and land. It so happens that we are living in a culture that is predominantly Judeo-Christian, so we emphasize Satan. If we were living in Roman times, the central figure, perhaps the title of our religion, would be different. But the name would be expressing and communicating the same thing. It's all context." 3. "I wish that my childhood would have been different. I do not, however, regret what happened. This does not mean tht I would gladly go through it again. But mythologies of all times and all places tell us that those who enter the abyss and survive can bring back important lessons. I have no need to merely imagine the unimaginable. And I will no longer forget. I have learned that whether I choose to feel or not, pain exists, and whether we choose to acknowledge them or not, atrocities continue. I have grown to understand that in the shadow of the unspeakable I can and must speak and act against our culture's tangled web of destructiveness, and stop the destruction at its roots." 4. "Mythologies become exhausting burdens, from a writer's perspective." 5. "He reads histories and mythologies and fairy tales, wondering why it seems that only girls are ever swept away from their mundane lives on farms by knights or princes or wolves. It strikes him as unfair to not have the same fanciful opportunity himself. And he is not in the position to do any rescuing of his own." 6. "Fiction is a branch of neurology: the scenarios of nerve and blood vessels are the written mythologies of memory and desire." 7. "But it is one of these sort of mythologies about America and its intellectual history, that the right embraced this thing called social Darwinism, when it never did so." 8. "Mythology is composed by poets out of their insights and realizations. Mythologies are not invented; they are found. 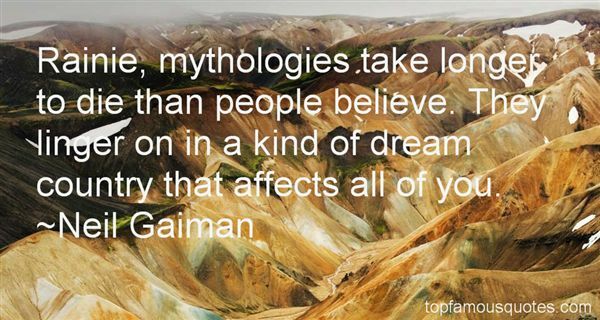 You can no more tell us what your dream is going to be tonight than we can invent a myth. Myths come from the mystical region of essential experience." 9. "I loved all the world's mythologies." 10. "He finally understood...the thing that the people during the Paleolitic Age, freaking 20,000 to 8,000 B.C., were after when they came up with mythologies to do with flight—a desire for the magic of the sky, for something bigger than their feet treading the earth." 11. 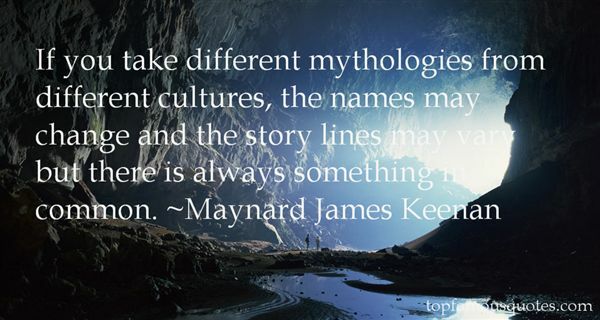 "If you take different mythologies from different cultures, the names may change and the story lines may vary but there is always something in common." 12. "Rainie, mythologies take longer to die than people believe. They linger on in a kind of dream country that affects all of you." 13. "'Doctor Who' was the first mythology that I learned, before ever I ran into Greek or Roman or Egyptian mythologies." 14. "Corny trash, vulgar clichés, Philistinism in all its phases, imitations of imitations, bogus profundities, crude, moronic and dishonest pseudo-literature—these are obvious examples. Now, if we want to pin down poshlost in contemporary writing we must look for it in Freudian symbolism, moth-eaten mythologies, social comment, humanistic messages, political allegories, overconcern with class or race, and the journalistic generalities we all know." 15. "I made my song a coatCovered with embroideriesOut of old mythologiesFrom heel to throat;But the fools caught it,Wore it in the world's eyesAs though they'd wrought it.Song, let them take it,For there's more enterpriseIn walking naked"
If Uncle Martin were here today, he would surely commend us for giving honor where honor is due."